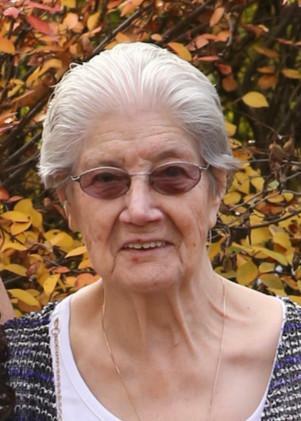 Barbara passed away peacefully on January 20, 2019 in Macklin, Sask., in her 86th year formerly of Bauline. She was surrounded with the love of her daughter Carol Ann, granddaughters Pamela and Jessica, and her loving care givers. Predeceased by her husband Joseph Moss; children: Andrew (Andy) King, Deborah (Debbie) Dominy and William (Bill) Moss; cherished granddaughter Chelsea Moss; parents: Joseph and Naomi King; brothers: Eleazar, Mark and Henry; sisters: Clara, Edna, MaryAnn, Julia, Bernice and Minnie. Leaving to reflect and cherish good memories are her children: Robert “Bob” Moss (Yvonne) and Carol Ann Moss/Klemky (Allan); daughters in Law Tammy Moss (Glen) and Debbie King; son-in-law Fred Dominy; grandchildren: Jessica (Andy), Matthew, Pamela, Stephanie (Todd), Naomi (Jon), Kenneth (Ersilia), Chelsea, Julie and Nicole; great-grandchildren: Jacob, Lukas, Colby, Zephyr, Carter, Abaigail, Colton, Dominic, Aleigha and Mikaela; brother: Bernard; Also, numerous nieces and nephews with a special bond with Gary, Barbara, Patsy and Lees, other relatives and friends. To her dedicated care-givers, you enriched her life over the past several years. Thank You. Donations of flowers gratefully accepted. Barbara loved to garden, and she had a knack of growing the most beautiful flowers. Or donations to St. Joseph’s Health Center or Bauline United Church in her memory. Resting at Carnell's Funeral Home, 329 Freshwater Road, on Tuesday January 29 and Wednesday January 30 from 2-4 and 7-9 p.m. Funeral service will take place from Bauline United Church on Thursday January 31 at 2:00 p.m. with interment to follow at the Bauline United Cemetery, Pouch Cove Line To send a message of condolence please visit www.carnells.com.